Like millions of other Americans, I watch the NFL on a regular basis. However, just like millions of other viewers, most Sundays I am not sure which games will be on my television. I live in Austin, so there’s a good chance I’ll get to see the Cowboys and Texans, but beyond that, there’s no way for me to know what to expect. Because of the nature of the league’s broadcast deal, and the realities of “regional coverage,” every Sunday the league’s national broadcast partners Fox and CBS assign different games to different markets, based on both regional and national interest. So unless you have a premium NFL television package, your location greatly affects your viewing experiences. Folks in Wisconsin get to watch their Packers every week; folks in northern Florida “get” to see the Jags. For years, the strange geographic structures that underpinned league broadcasts were almost entirely obscured from the average consumer. People would turn on their TVs expecting to see one game only to be disappointed by another. In 2005, one of these chronically disappointed viewers was J.P. Kirby, a Patriots fan and self-described “map nerd.” “The station’s site said one thing, the guide in my newspaper said another, and what ended up showing was another game completely, and it wasn’t the Pats game,” Kirby, 32, a web designer in Fredericton, New Brunswick, told me by email. “I was pissed and figured there had to be a better way to figure this out.” Kirby had an idea to expose the hidden geographic patterns that control our Sunday afternoons: He created a project dedicated to mapping out the NFL’s weekly broadcast schedule. Today, Kirby is still meticulously scanning the Web every week of the season to find football broadcast schedules for different markets around the United States. He then maps them out for all the world to see on 506sports.com.1 Here is one of his maps for this coming week. It’s a simple map that shows which regions see which late game on CBS on Sunday afternoon. 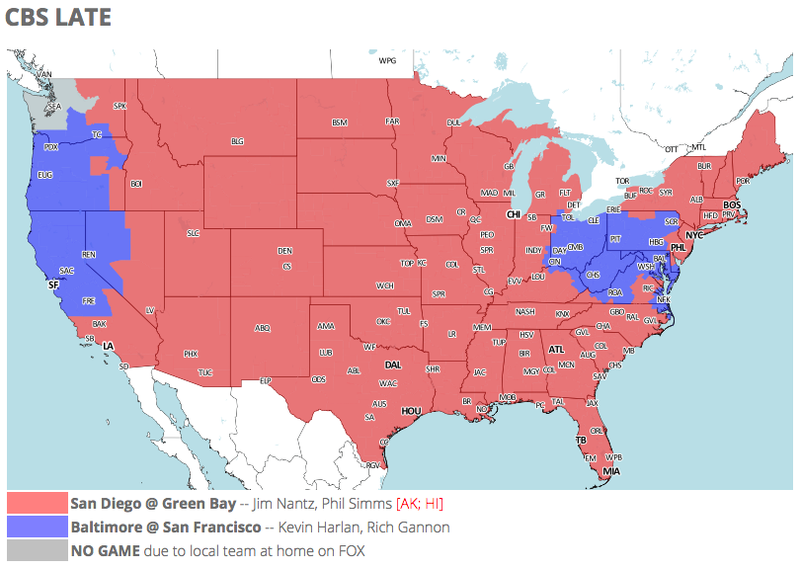 As you can see, the country is split between those seeing San Diego at Green Bay (red), those seeing Baltimore at San Francisco (blue), and Washington state residents seeing Seattle host Carolina. Displaced Seahawks or Panthers fans in New York City won’t get to see their favorite team on local television this week; instead, they’ll be shown the Chargers-Packers game. 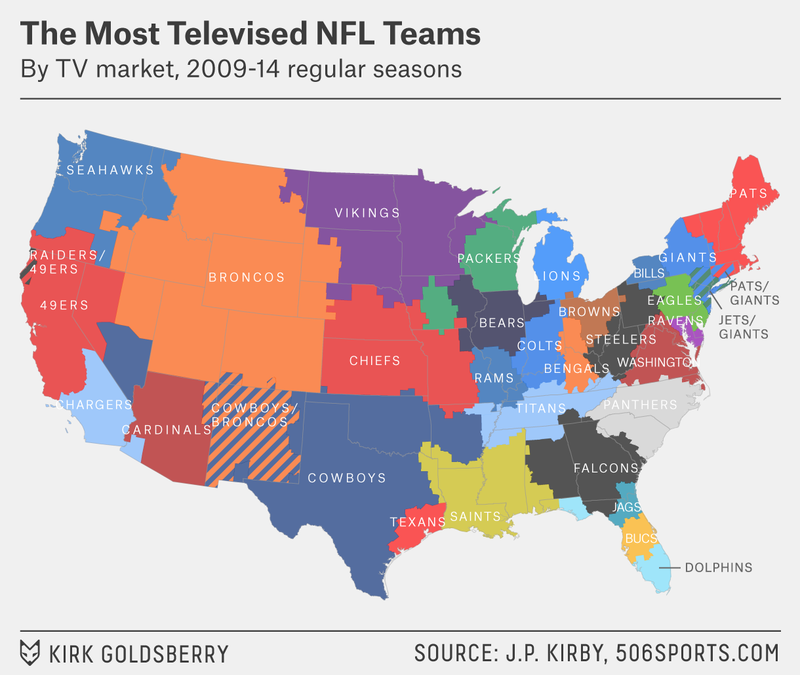 But while Kirby’s project does a good job of visualizing the spatial coverage of NFL broadcasts each week, that’s not all it does; the archive of data he’s compiled over the years also helps us understand larger geographic patterns in NFL television. His data reveals which teams we see most and least often each season and across multiple seasons. It’s a reflection of both regional broadcasting choices for Sunday day games and national programming selections for the night games on Thursdays, Sundays and Mondays2. The choices matter throughout the U.S. and even outside of it: Kirby, who lives an hour from Maine, has access to U.S. networks, which is why he started collecting the data. We expect the map to look like that: Georgians want to see Falcons games, for instance, while Michiganders want to see Lions games. However, things get a bit more unpredictable when we map the second most commonly televised team in each area. There’s a lot going on up there. With the exceptions of Carolina, Cleveland and San Diego, every team is the second most televised team somewhere. It’s strange to see Minnesota mostly covered by Packer Green and the whole of Louisiana colored Cowboy blue, but there’s some obvious regional logic there. The same goes for the vast area colored by Oakland black and Houston red: Someone has to play second fiddle to the 49ers and the Cowboys, and another team from the same state is the obvious candidate. You can’t say the same about the Patriots being aired so often in the Carolinas, the random pocket of Eagles’ ubiquity on televisions in southern Oklahoma and northeastern Texas, or the frequency with which Giants games are televised in greater Las Vegas. 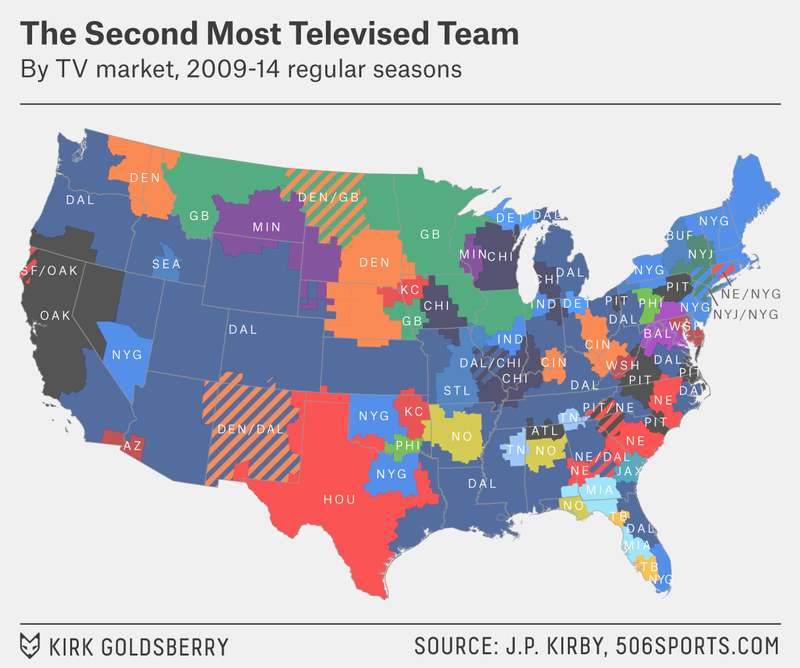 Still, the main takeaway from this map is that them Cowboys are on TV a lot all over the place; they are by far the most broadcast team around the country. Over the past six seasons, they were either the first or second most commonly broadcast team in 95 of just over 200 markets around the U.S.,4 a dominance that appears on the West Coast in markets including Seattle and Los Angeles, and on the East Coast in Jacksonville, Florida, and Greenville, North Carolina. Between 2009 and 2014, every Nielsen market in the U.S. saw at least an average of nine of the Cowboys’ 16 games each season, by far the most in the league. Just about the only time the Cowboys aren’t dominating the airwaves is during bye weeks like this one. Meanwhile, the Bills, Browns, Jags and Bucs are the teams broadcast least often nationwide. A vast majority of the country has seen these teams less than three times per year over the past six regular seasons.6 But as you can see, despite that meager nationwide showing, these teams are still broadcast often near their home cities. We ranked teams by their share of TV markets, but the picture doesn’t change much if we weight the markets by number of homes with televisions, to get an estimate of the potential number of viewers of each team.7 Even after accounting for the Giants’ mammoth home New York City market, which has roughly one of every 15 TV homes in the country, Dallas is still king. The NFL Sunday Ticket package exists for a reason: Many times people would rather watch a game other than the ones prescribed to them during regional coverage. Take it from someone who lived in Michigan when the Lions went 0-16: Sometimes regional loyalties subject us to terrible television experiences. But as long as the NFL’s broadcast deals are structured as they are now, the programming choices dictated by these loyalties aren’t going to change. Thanks to Kirby and 506sports.com, at least we can see we’re not the only ones subjected to mediocre games. And that hasn’t changed this year. 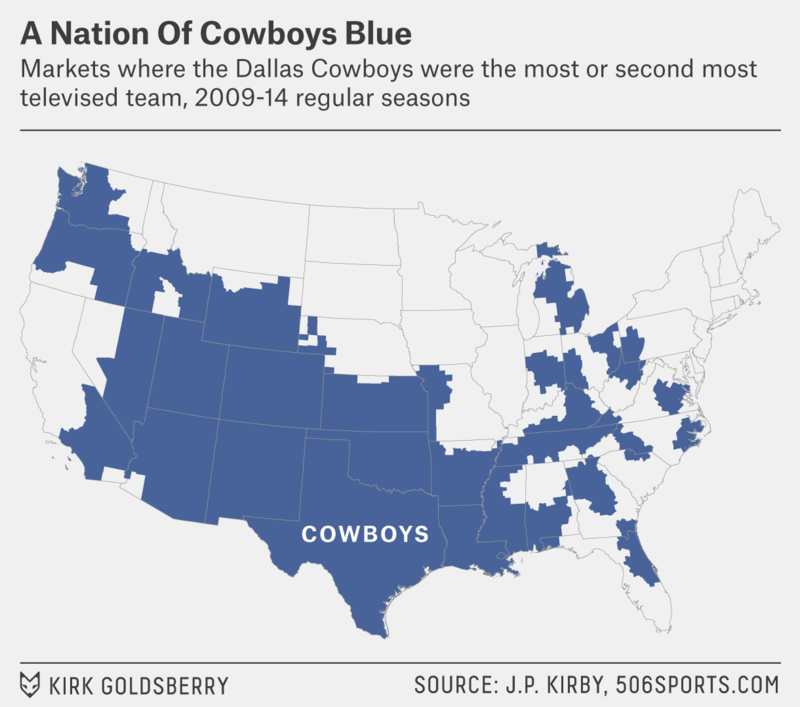 Although our maps only run through last season, Kirby confirms that the most broadcast team in 2015 is the Cowboys. “Even at 2-3, the networks are still in love with them,” Kirby said. CORRECTION (Oct. 16, 10:45 a.m.): An earlier version of this article incorrectly characterized the most televised NFL teams in greater Las Vegas. The Giants are the second-most-televised team but are not interrupting the dominance of the Cowboys, who are the most televised team in the region. Named for the area code in New Brunswick, where he lives. Monday night games are broadcast by ESPN, which owns FiveThirtyEight. Though Kirby has been tracking broadcasts since 2005, he didn’t start archiving the data until the 2009 season. The number of Nielsen-designated U.S. markets fluctuated during the six years of our study. The analysis, though not the maps, includes Alaska and Hawaii. We tallied the total number of broadcasts for each team across a total of over 200 markets in the U.S. between the 2009 and 2014 seasons. Dallas had the highest score, followed by the New York Giants, Green Bay and Pittsburgh. Of a little over 200 markets studied, 177 averaged less than three Bills games per regular season, 179 averaged less than three Browns games, 155 averaged less than three Jags games and 154 averaged less than three Bucs games. We are using this to measure how many people could have watched each team. Actual viewership would depend on lots of factors other than what’s available on TV, such as whether anyone wants to watch the team whose game is being aired.